When Comic Books Ruled the Earth: Every Old Katana is New Again! 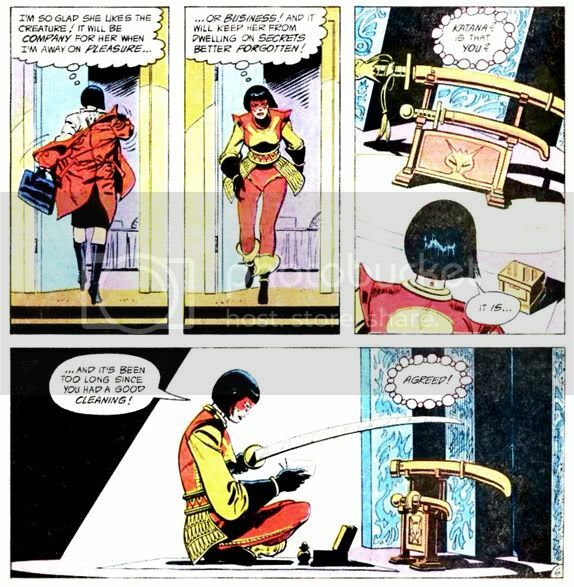 Created by writer Matt W. Barr and artist Jim Aparo, Tatsu "Katana" Yamashiro's been bouncing around the DC universe since 1983 when she debuted in the pages of The Brave and the Bold #200. Despite his long held aversion to killing, Batman allowed Katana to join his Outsiders group, where her place was roughly the same as that of Wolverine in the first Chris Claremont-written issues of Uncanny X-Men. Like their Marvel analogues, the Outsiders were originally an international team. Katana as one of the few members from a real nation with a real culture to explore, even if in a somewhat superficial way. Her code-name is the Japanese word for the main sword used by samurai, a similar situation to when I appeared as a character in a manga about dorks who blog about comics and called myself Computer Keyboard. Strangely enough, her sword wasn't always a proper katana. In some issues, Jim Aparo's version appears to be a no-dachi, a longer bladed weapon used for chopping down riders and horses so one might have a better chance at fileting the fallen enemy. And not just any no-dachi; it's a magical one named Soultaker because it contains the souls of all killed by it-- which gives it more of a Moorecockian lineage than anything having to do with samurai-- including Katana's dead husband. To whom she talks fairly often while... er... polishing him. It. I mean "it." 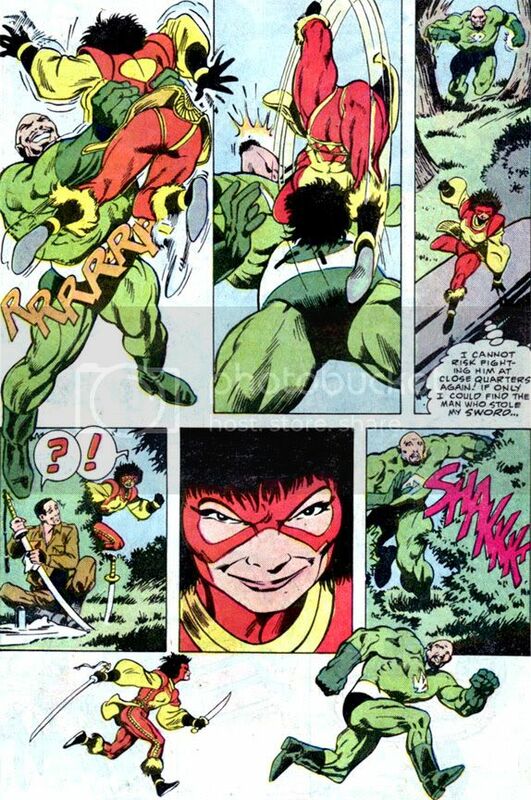 Alan Davis's sword is more the classic katana, although as you can see, its size sometimes varies from panel to panel. 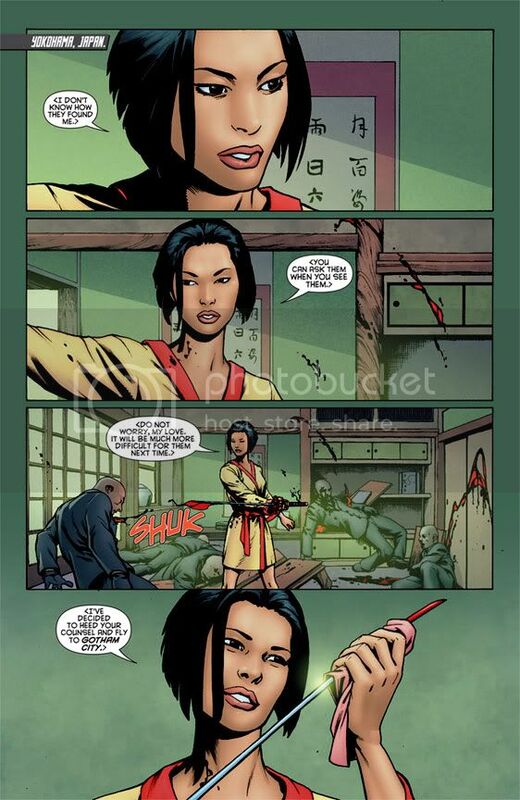 "SHAKKKT" was Katana's version of Wolverine's famous "SNIKT." But however an artist depicted the weapon, once it was in Katana's hands even the largest of enemies understood discretion as the better part of valor. We can only imagine that quizzical guy... polishing... Katana's sword there lying in the bushes in two neatly bisected pieces, the grass covered in red slowly drying to a brown crust. No word from Katana's dead husband on how much he enjoyed the poor fellow's loving hands, though. Since Katana's a comic book Japanese person, writer Mike W. Barr characterizes her as secretive and largely emotionless, expert at martial arts and the ways of Bushido. The other choice for comic book writers at the time was to write their Japanese characters as arrogant and frequently infuriated for no reason; i.e., the female Dr. Light and Sunfire over at Marvel. And experts at martial arts and the ways of Bushido. Katana's backstory also contains an ex-lover in the Yakuza for the customary family honor business. Once again, this was during the era when The Uncanny X-Men and its break-out character Wolverine-- especially the version drawn by Frank Miller-- had made all things Japanese cool and hep in the superhero genre. In Katana's case, think Wolverine's doomed fiancee Mariko Yashida, only this time she's the stone-cold killer instead of just giving someone else justification for his various murders. Okay, so we've established Katana as an efficient martial arts-based hero with a fancy sword. But what about her powerful maternal nature? This is what makes her unique among comic book martial artists. 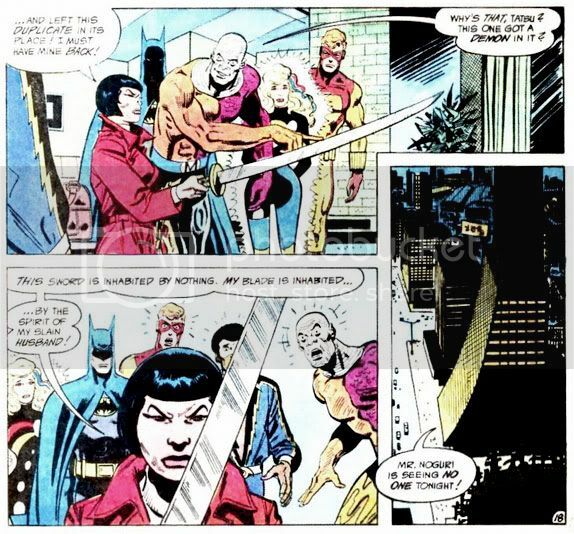 Sure Lady Shiva spends a lot of time trying to repair her relationship with biological daughter Cassandra Cain, but that's only because it's every parent's dream to fight her offspring to the death for the leadership of a secret cabal of international assassins. Katana, however, truly embodies the classic nurturing archetype. You know: the extraordinarily deadly martial artist mother with a fancy soul-eating sword. On the rare occasions when she does show emotions (I mean other than the joy that comes from bisecting an anonymous thug with with a perfect killing stroke), Katana largely directs them at her naifish teammate Halo. During the first few issues, the two quickly form a sort of familial relationship, with Katana as the strict and occasionally insanely protective and possessive parental figure who seems obsessed with her young charge to the point of stalking her. Finding Halo working as a roller-skating server at a fast food join in #43, Katana demands she quit and then rather desperately offers to buy the girl any clothes she wants. Which is kind of wacky, considering Katana herself was the one initially trying to push Halo into the superhero equivalent of a "normal life." You know, attending school, hiding your powers from your classmates, donning disguises, lying to everyone you meet, jetting off at odd hours to kill people all around the world. Classic Katana may have been two parts stereotype to one part Faye Dunaway as Joan Crawford in the trash classic Mommie Dearest, but she was also a pretty cool and compelling character for those of us who are into Sonny Chiba movies and Koike Kazuo comics. 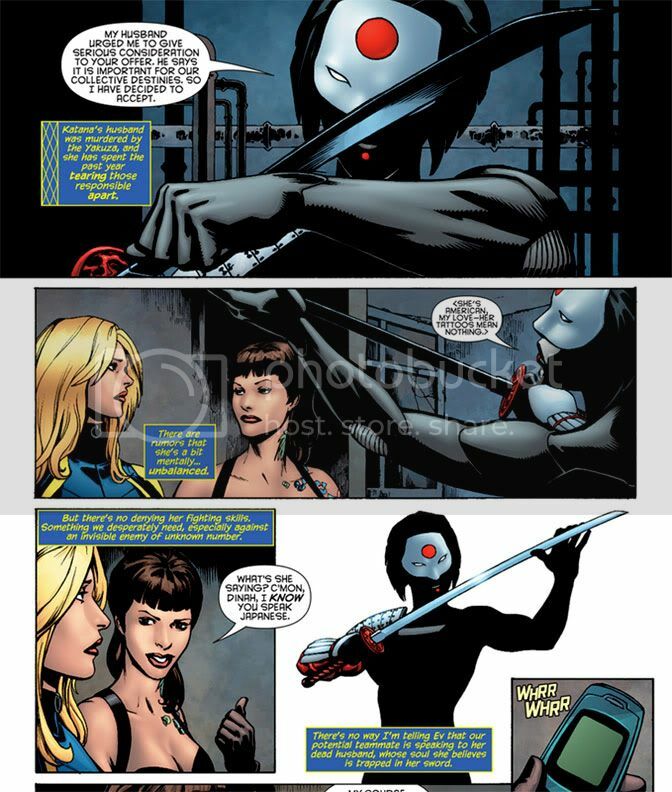 What about contemporary Katana, now that she's got a regular monthly gig again, but no longer with the Outsiders? Some things about her are comfortingly familiar. She's still a working part of a renegade team of heroes, this time the Birds of Prey alongside Black Canary, Starling and Poison Ivy. "SHUK" instead of "SHAKKKT," but Katana shows up in Birds of Prey #2 (by writer Duane Swierczynski and artist Jesus Saiz) and immediately racks up quite the body count. On her first page, she's already diced and cubed five members of the Crazy 88s without changing her facial expression. Or even having one. Katana kills and kills and in between killing she sometimes takes breaks to kill. Why, I remember this one time Katana woke up, killed a couple of guys on the way to the kitchen, poured herself a bowl of Frosted Flakes, killed three more guys while getting the milk from the refrigerator, ran outside to kill a team of ninja trying to steal her morning paper, then killed a few more people on the way back to the front door before sitting down and reading For Better or For Worse while eating her cereal; a breakfast ritual for her-- she loves that strip. She spent the rest of the day killing. "SSSSSHK?" Wrong again. It's "SHAKKKT." Just a flesh wound. The flesh being the center of that guy's heart. I don't think those two rubes in the bottom panel are going to be bouncing their children on their knees or swinging them up to the blue, blue sky anytime soon, either. Or breathing. No one really seems interested in stopping her murderous ways, which is kind of odd. We all love dark stories where the murk hides the boundaries between right and wrong, but honestly, what kind of hero team amasses that many corpses and remains a hero team? And why don't the international authorities care about due process and basic human rights? Sure, these are villains and some of the killings can be justified as self-defense, but one has to wonder how many and what the limitations are on deadly force as they pertain to superheroes. Hey, I'm not judging her. I'd rather have a killer Katana than a Katana who waves around a mostly useless sword and only uses it to cut ropes and buttons off villain shirts and pants. I'm just wondering why people like Black Canary-- and even Batman back in the day-- tolerate it, and why Interpol or the United Nations or even Amnesty International doesn't get involved at some point. I understand why Starling doesn't; she's too busy shooting people in the face. Katana has evolved on other ways over the years. Her costume was once Ronald McDonald-esque with a vaguely Asian motif. Now she's one of the more visually impressive heroes in DC's roster. The new Superman flies around in a hideous cast-off that looks like a collaboration between Mr. Data of Starfleet Hills and the people who invented "Mighty Men and Monster Maker" (when he isn't wearing a bath towel, t-shirt and jeans), Batman now wears a codpiece or an adult incontinence pad, but Katana sports a sleek armored suit reminiscent of Japanese lacquer wear, with a samurai shoulder protector and greaves. She hides her face behind a half-mask and Kabuki-inspired make up. It's an extreme look, making her somewhat monstrous and robotic and all together menacing. She's one of the few sensibly protected female characters in comics. We'll probably learn later it's a plastic bikini and some kind of shiny body paint. But until that day comes-- and perhaps it never will-- she looks fantastic. Not someone you want to mess with. Or sit next to on a crowded train. Also different is her hair style. No more bangs or Louise Brooks bob, nor does she sport the Davis-era shag. But the change most telling of its era is that it's now ambiguous as to whether or not her sword contains her husband's soul. She obviously still believes it does, but we readers are no longer party to their conversations. Black Canary and Starling are presented as kind of dubious about the whole "talking to an inanimate object" thing as well. The point is to call into question Katana's hold on reality. Is she a little off? A little nutty? That makes her all the more dangerous. And anyway, flying people and half-robot people are completely within the realm of possibility, but talking swords are only ridiculous, right? Katana no longer uses contractions when speaking English. As one of those EFL teachers over here in Japan, I find that kind of difficult to believe in someone who's as fluent in English as Katana. It does give her that cold, almost inhuman feel to go along with the costume. I have a hard time accepting a stiff, overly formal Katana knowing what I know about her relationship with Halo. Still, as we've seen, people do change and Katana most of all. On that note, time will tell if she's still competing for Substitute Mother of the Year. I hope she is. It gives her depth and humanizes her so she's not just a relentless human lawnmower-of-faceless-goons. I hope she fixates on Starling and starts smothering her with concern and buying her clothes to cover that gothy corset top. Or, alternately, offering to pay for more tattoos to make her arms appear more symmetrical. I've never been a huge Katana fan. There's just something too on-the-nose about a Japanese character who uses a katana that's also named Katana and tends to wear Japanese flags for costumes/on her face. The only time I started warming up to her was when she started acting like a surrogate mother to Cass in Batman and the Outsiders, but that lasted like two issues before the team got totally revamped. And I have never understood why Batman seems to like her so much, given that she kills people and he's pretty much against that sort of thing. Maybe he's totally okay with death by sword, and it's just those icky guns that freak him out. Oh yeah, when Katana first appeared in comics, Japanese themes were all the rage. You couldn't throw a Wolverine at a Sentinal without hitting a ninja. It's like everyone involved with Batman and the Outsiders told each other, "We gotta get us some of that!" But once you start really picking her apart, she just gets stranger and stranger. People turn a blind eye to all her killings, she chooses a teammate and obsessively mothers her. What exactly is going on here?